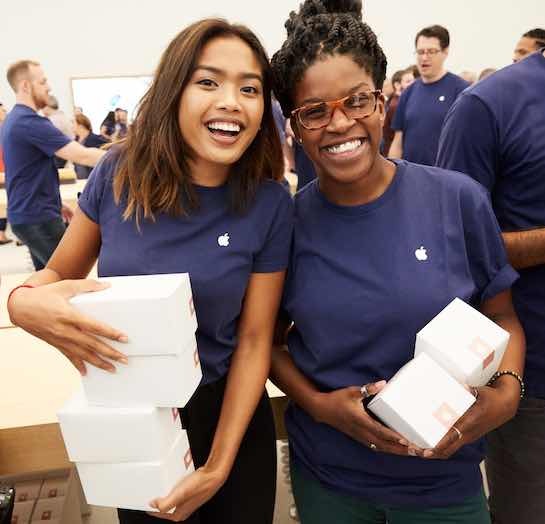 Apple held all-hands meetings with retail employees this weekend to introduce major new changes, including new and renamed positions, a new credo, and new store layouts, according to multiple retail sources. • Technical Expert: An all-new customer support position in between Technical Specialist and Genius. These employees will be able to provide mobile repairs, a task previously limited to Geniuses, and troubleshooting for software and products like the Apple Watch and Apple TV. The position will help reduce Genius Bar/Grove and service wait times. Meanwhile, the Back-of-House is now called Backstage, where the Inventory and Operations teams work, and the Red Zone, which encompasses the sales floor, is now called the Product Zone. Apple's existing retail locations will use the same tables from the old Red Zone for the new Product Zone. Last, Apple said it now has over 30 retail locations based on its new design language, including the flagship Apple Union Square. The new layout includes a combination of The Avenue, Genius Grove, The Forum, The Plaza, and The Boardroom. Apple is renovating dozens of locations with the next-generation design, and all new locations since mid 2015 have been based on the new design language. Credo is cheesy. Vacuous corporate feelgood blather. As always, they'll be judged by their actions, not words. Just makes me cringe reading this. Reminds me of the BS titles and gimmicky chants Best Buy used to make us all do when I worked a high school job there. LOL. Employees just roll their eyes at this stuff. As far as "Backstage" and other silly names for parts of the store, it just smells like moldy cheese... like Apple is trying to reinvent the wheel, at least from a customer outside-in view. It looks stupid and makes it feel like Apple is belittling me as a customer. The problem as I see it as a long time customer, is that the method of hiring has changed so much since the "old days" ... used to be when you walked into an Apple Store, you were greeted by people passionate about the product. I know a lot about the technical side of Apple products, and loved that someone working in a retail store was at the same level and could talk the talk. It seems like their pay back then got that sort of employee, but it seems like pay hasn't changed, so now for the same pay 15 years later they get basic retail employees. Now it seems when you go in, the employees working are just regular retail drones, many of which don't have or want an iPhone, and don't have or want a Mac, they just need a job while in school, or a job to make some summer money. The hiring has shifted, maybe a result of such low unemployment, not sure. Yeah some of the old days guys are there, but not many. It's just really sad to see where Apple Retail was and where it is today. It's not the experience Steve wanted when he launched the store. I understand times change, and retail does as well, but it feels like with Angela in charge things have gone from great, to status quo retail, to now just weird and unproductive. Hopefully things get better, because I'm not sure how many more product launches I can sit through where I go in and am told to get the product they have sitting in their back room I have to go online and order it then come back. So even their employee's get the 'Pro' title, besides their products. Seems the 'Pro' term is a little over used in my opinion. The store isn't going to be helping me to enrich my life, I need a computer that has updated specs to enhance my life, the best start for me to enhance my life is to be able to compete with peers in my industry, who generally use PCs which out perform my mac, for less money. No amount of Disney-like delusion and rah-rah will fix outdated hardware across the entire platform. iPhone Pro is definitely happening next year. More precisely, Plus will be renamed as Pro. I'm sure glad they're spending all this time and effort on these extremely critical restructures and poems instead of those wretched MacBooks.